I used to like Sara Lee's pound cake...simply love it especially served chilled right out from the fridge. I was even guilty of eating slices of it topped generously with whipped cream. It was never a rare sight to catch me enjoying a slice with a big scoop of ice cream. Thank goodness, those were the days when my body was young enough that I did not accumulate all those fat on my waist! My eating habits changed since I started cooking and baking. I no longer crave for sara lee after I realised how much fat and sugar goes into the making of a pound cake. The traditional way of making a pound cake will use 1 pound each of the four basic ingredients - butter, sugar, eggs and flour. You will need almost 2 blocks of butter, more than 2 cups of sugar, 8 large eggs and at least 3 cups of flour just to make a pound cake. While there are healthier versions around, most pound cake recipes till use these same ingredients ratios of 1:1:1:1. It was only after reading the book that I discovered my mistakes. First, on both attempts, the batter started to curdle when I added too much eggs at one go. No problem, I thought, by adding one tablespoon of flour, the problem was solved. This happened at least twice while I was preparing the batter. Little did I know that this will actually cause the texture of the cake to be hard and dry! Besides the dry texture, I also had problem with pound cakes not rising well above the rim. The problem lies at the folding of the flour into the batter. I have long since developed the habit of stopping when the flour has just incorporated into the batter. This book, however, recommends to continue to fold the mixture until the batter appears smooth and glossy. This method will increase the gluten formation in the flour, and as a result, the cake will rise and expand beautifully upon baking, and yet produce a cake that is soft, tender and moist. 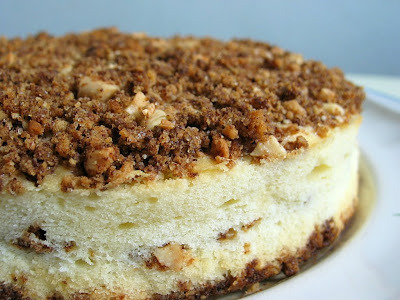 Just like to share with you this interesting method of topping the streusel on the cake. Instead of making the streusel into crumbs, the ingredients are mixed to form a dough and left to chill in the fridge. When ready, the streusel dough is then grated over the top of the batter. The dough works well in the beginning, but with my warm hand and the heat, it started to soften halfway before I was done...making it more and more difficult to grate. The next time I were to make this, I will divide the dough into two, using one at a time while the one remains chilled in the fridge. The finished cake proves to be soft and moist. Not sure whether it is due to the method or simply because of the bananas?? Nevertheless, the cake is indeed very delicious, not forgetting the banana-y fragrance and the nutty, buttery streusel toppings. I am glad that I have finally produced a decent pound cake, and will love to try a few more recipes, and also to experiment with two other different methods...ie the separate eggs method, and the one bowl method which calls for adding the butter into the flour mixture instead of the common creaming method. To make streusel, place butter, icing sugar and cake flour in a bowl. With a fork, mix together the ingredients to form a soft dough. Leave in the fridge to chill. Break walnuts into pieces, place in a baking tray and toast it in a preheated oven at 100degC for 10mins. Set aside to cool. Line pound cake pan (18cm x 8cm x 6cm) with baking paper, set aside. Sieve flour and baking powder together, set aside. Place butter in a mixing bowl. With a handheld electric mixer, beat the butter for a few seconds on medium speed. Add half of the icing sugar and continue to beat till the sugar is incorporated into the butter mixture. Add the remaining half of the icing sugar and continue to beat till the mixture turns pale, light and fluffy. Add in the vanilla extract and the mashed banana. Fold with a spatula till just incorporated. Do not over mix as it may cause the batter to curdle. Sieve over the flour and baking powder mixture. Fold in the flour mixture with a spatula. Once the flour is incorporated into the batter, continue to fold for 1 to 2 mins until the batter appears smooth and glossy. This step is important so that gluten in the flour will be formed which will help the cake to rise and expand during baking. Pour finished batter into prepared pan. Spread batter and smooth top. Sprinkle the walnut pieces on top. Lightly press into the batter with spatula. Remove chilled streusel dough from fridge. Grate the dough over the top of the batter. Work quickly as the dough will soften very fast (especially on hot days). Bake in pre-heated oven at 170degC for 25 mins. Remove pan from oven and make a slit with a wet knife (dipped in water) across the middle. Return to oven and continue to bake for 35 - 40mins until a skewer inserted into the centre comes out clean, and the top is golden. Unmold and leave to cool completely. Store in air-tight container or wrap in cling wrap. Pound cakes are best eaten the next day. I was like you...chomping lots of Sara Lee cakes before all my baking "adventures". Now seeing the amount of butter added into these buttery cakes, I sort of reduce my cake consumption. Strongly believe that home made is the best too...because we use good quality ingredients and can choose to bake healthy recipes with less fat and sugar. 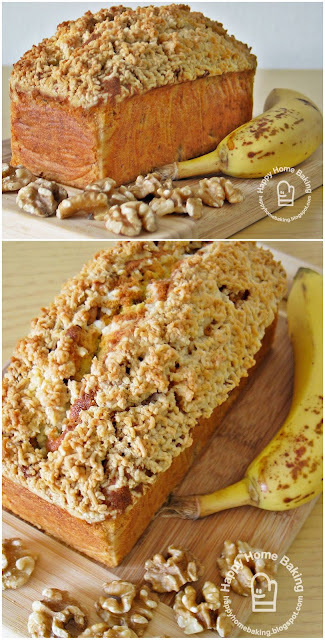 This cake looks delicious and has great amount of good fat and fiber in the form of walnuts and banana. I love anything with banana in it and this one with the streusel looks really yummy. Btw I used to eat Sara Lee cakes too but not any more since I starting baking. That looks so yummy! Thanks for sharing your lessons and pitfalls, too. I must try baking one sometime. Not now, though. At present, bananas are A$12.99 a kilo in Western Australia. There's a nationwide shortage after the Queensland floods. That means bananas go for around A$2 EACH. Cool idea with grating the streudal topping over! Will try it next time. ;) hey, I don't mind sharing the pound with you...heehee, pass some over yah? Thank you fir sharing your tips and insights to the making of the pound cake, HHB.. Love the generous streusel topping! Wah, this one dun look like normal pound cake (cos I only see sara lee before haha). Very nice and grand looking (like one of your reader said). I want to eat the cake but I don't want to share the pound with you. How? I love sara lee too, but only chocolate and the swirl. I hope I can one day bake one like sara lee. But seriously, after starting to bake, I worry alot about eating them since I knew there are large amount of butter, and sugar added. Actually even too much flour is fattening isn't it? Haiz, but I love to eat cakes leh. Interesting account. What a wealth of information. Thank you! Hi there, I came across your blog while searching for reviews on the Bosch HBN331E2J. So did you get this oven in the end? How would you review it for baking and grilling? Does it have the top and bottom heat with fan function? I couldn't really decipher this from their website. Hi, It's nice to see your work here, the preparation looks really great. I also like your blog. It's inspiring to me see what you share with us. Have a nice weekend, I follow you now!! Oh! I"m so glad I stumbled across your blog! interesting to know the part of grating the streusel! Hi naturefall, I bought the Bosch oven. So far the oven works fine for me as I only do very simple bakes. Yes, there is this top and bottom heat with fan function, I use it whenever I need to bake two trays of cookies or pizzas. Hope this is useful. Hi my name is Ashley DeMazza. I live with the rest of the DeMazza family in Falls Village CT. This looks like just the sort of recipe my family would love. Thank you so much for sharing. HHB.. I am most willing to share the cake / calories! YOur cake look so beautiful! I wanna book mark this. Love the generous streusel toppings - I am sure it taste great! Thanks for sharing. The streusel on top looks delicious. Next on my 'to bake' list. Thanks for all the tips and keep up with the great pics, recipes and valuable tips, I have learnt such a lot from you. Oh,.... I add a bit of the flour in the recipe when curdling occurs, that way amount of flour stays the same and cake doesnt become dry. Hope that helps you. Hi HHB! It's me again. The question that I'm going to ask is not about baking.Can you tell me how you make the logo? I'm curious about it. This was very helpful. Streusel seems like a combination of crumb cake and pound cake to me, but it has an amazing topping. Where can I find the recipe for the walnut crumble cake. I could eat the picture it looks so good. You are amazing! so glad I found you. I had so many problems with this recipe. I used room temp butter and eggs, added the eggs a little bit at a time, but it still curdled. The streusel melted almost immediately after taking it out of the fridge and I was not able to grate it at all. The taste of the pound cake had no trace of sweetness and the banana flavor was almost non-existent. Needed more sugar and banana. Hi, I'm so sorry to hear that this recipe didn't work well for you. Did you manage to form the streusel into a soft dough? or could it be it was not chilled long enough? As for the banana, it is best to use over ripped banana for baking, it will be sweeter and will give a better flavour. Can I know how long should the streusel be chilled? I've little confidence with the streusel; I am planning to make one without the streusel. Do you think the cake will turn out good without the streusel topping? Hi Janice, the streusel should firm up within 30mins in the fridge...no worries about it, I am sure you will have no problem. 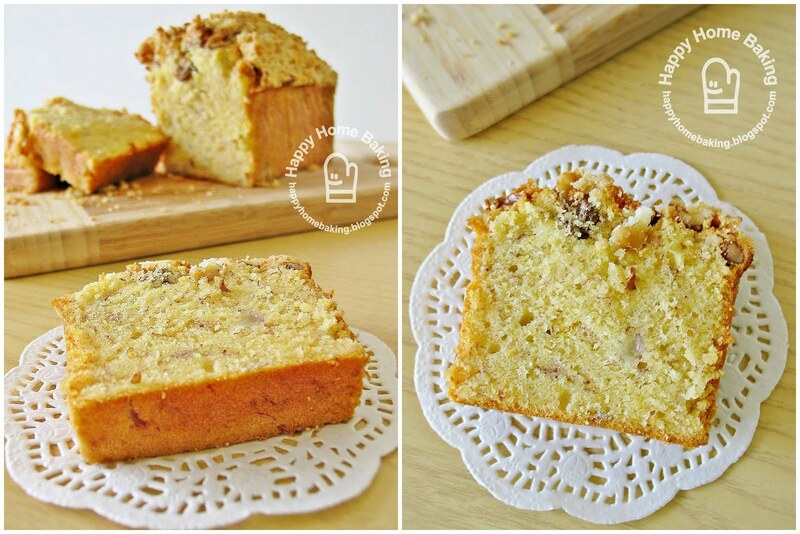 The cake will be quite plain without the streusel...oh, maybe to prevent the streusel from melting as u grate it, I will like to suggest that you form it into two separate dough, so that u can grate one at the time while keeping the other chilled in the fridge. hope this helps. While waiting for your response I've tried the Banna Walnut Cinnamon on your blog. It was very good, my friends and colleagues love it so much. Thanks for sharing. I'll definately try the pound cake.